In the last article, we looked at those players that are proficient at defending their serves well in the early stages of matches. 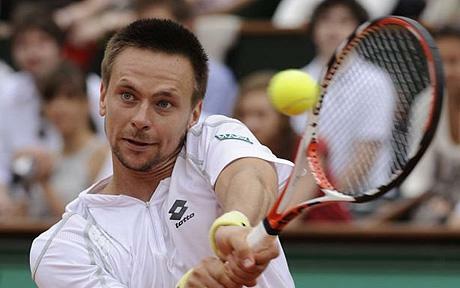 However, what really separates the top players from the rest is the ability to break serve. Without the ability to break, you are relying on tiebreaks and no matter how good a player you are, there is a significant element of luck in a tiebreak. In this article, we will look at those players that are able to take advantage of their opponent's serve in the early exchanges of matches and get off to a great start. From a trading perspective, the ability to identify players that have a strong ability to break serve early on could be invaluable. While the price may move slightly on a hold of serve, it is breaks of serve that provide the opportunity for more significant profit. Picking early breaks of serve gives the ability to build a good book within the first few games of the match providing greater margin for error later on. 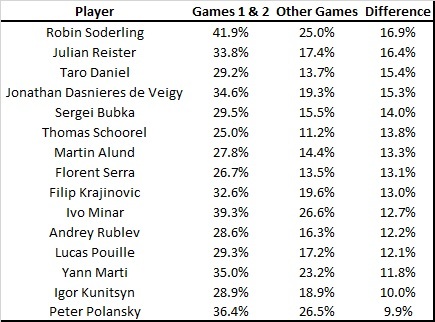 Although no long active on the ATP circuit, this table shows how good Robin Soderling was at getting off to a lightning start. His 26 breaks of serve from 62 opening two return games in matches is extraordinary and no other player comes close to this 41.9%. Andrey Rublev is an interesting one to keep an eye on here as well. He is still very young and if he can improve his stamina to the extent where he can keep up his quick starts, he could become a very good player. At the other end of the scale, there are some truly awful performances here. 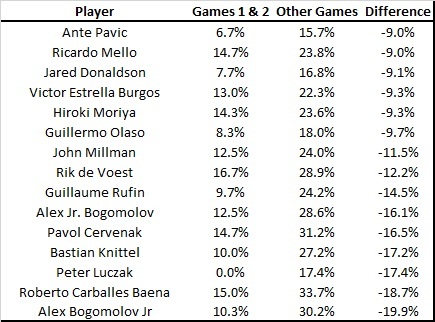 Peter Luczak has failed to break in his opening two return games in any of his 11 matches in the sample, while Alex Bogomolov's performance early on is poor compared to his improvement later in the match. One particularly interesting name to note here is Victor Estrella, who is the only player to appear in the bottom 15 for both serving and returning. It would certainly seem to suggest that if you are looking to back Estrella, it is worth waiting until he gets past the early stages of the match, at which stage, if he has managed to keep it on serve, you are likely to still be able to get virtually the same price as at the start. Here, we look at a number of top players and some of those that we identified in the previous article on serving. In terms of the young pairing of Borna Coric and Hyeon Chung that stood out as good starters on serve, there is a interesting difference here. Coric's strong start on serve is needed to cancel out his early difficulties on return, which could suggest that he requires a few games to really start to read the serve of his opponent. 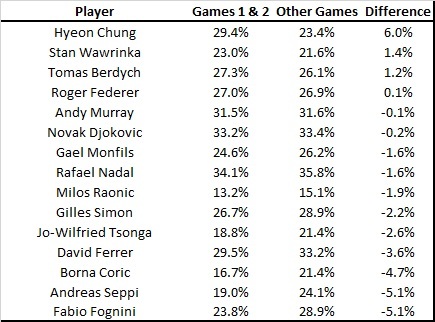 However, Chung also starts very strongly on return as well as serve, which raises an interesting question of whether he is simply very strong out of the blocks or whether there is an issue with stamina that causes his game to deteriorate from its initial high level. Once again, we see the Italian pair of Andreas Seppi and Fabio Fognini at the bottom of this list, just as they were on serve. It certainly suggests that for whatever reason, they both struggle in the early stages of matches, which is definitely something to bear in mind if you are looking to trade matches involving either of them.